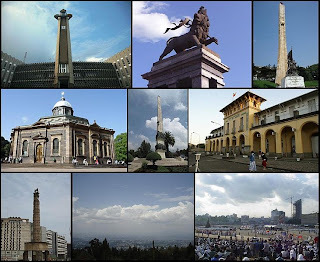 The capital Ethiopia, and Africa alike, are proud to call theirs is located in the middle of the country. The city has an area of 527 km2 and a population of about 3.5 million. Ever since its establishment, it has been the source of great pride and many achievements. Below are a few facts and places where one can find out more about the city and the country in general - museums. - The Ethiopian capital city was founded in 1886. Empress Taytu chose the site and her husband founded the city. - The name of the capital of Ethiopia, Addis Ababa, means "New flower" in Amharic - the Ethiopian national language. - Lying at an altitude of 2355 meters, it is the highest capital city in Africa and the fifth highest one in the world. - The Ethiopia capital has its lowest point in the Bole International Airport area and its highest is the top of the Entoto Mountains. - Addis Ababa is home to the largest open air market in Africa - The Merkato. - The city is also home to mankind's earliest relatives Lucy and Selam (both Australopithecus afarensis). - The capital Ethiopia, and Africa as a whole, call their own is home to the African Union (AU) and the United Nations Economic Commission for Africa (UNECA) among many other international organizations and institutions. - The Ethiopian capital is famous for its fair weather. As a matter of fact, Addis Ababa was voted to be the city with the best and most stable weather in the world. The National Museum of Ethiopia which is located in Arada Kifle Ketema, adjacent to the Faculty of Technology of the Addis Ababa University and St. Mary’s church. 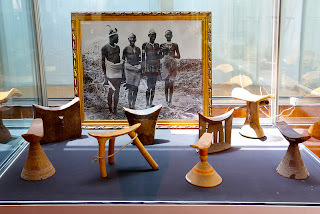 The Ethnological Museum of the Institute of Ethiopian Studies (IES) is located within the main Sidist Kilo campus of the Addis Ababa University (AAU). 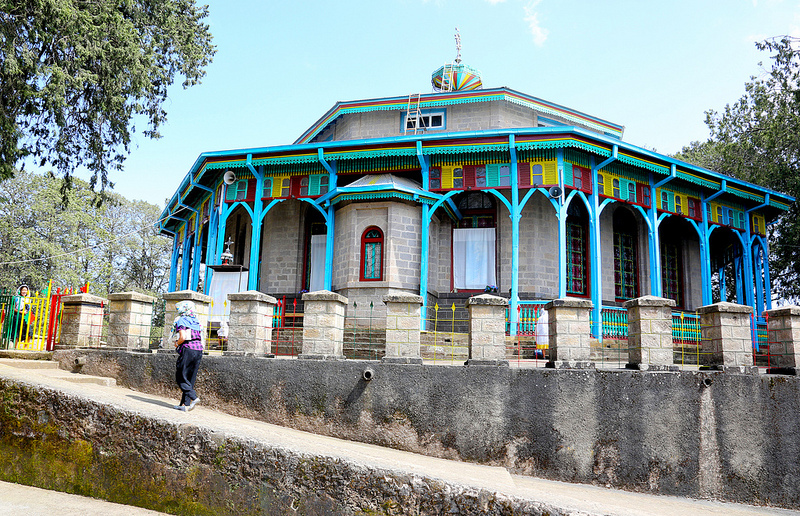 The museum is located in Arat Kilo, Addis Ababa inside the Holy Trinity Cathedral and bordering the Houses of Parliament. This recently modernized museum was established in 2004 to preserve and protect the heritage of past religious leaders and preserve religious icons and items. 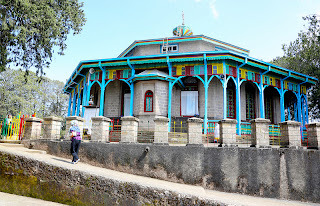 The museum (fully known as the Ethiopian Tewahdo Orthodox Church Patriarchate Museum and Library) is located at the Patriarchate Office and close to the National Museum of Ethiopia. 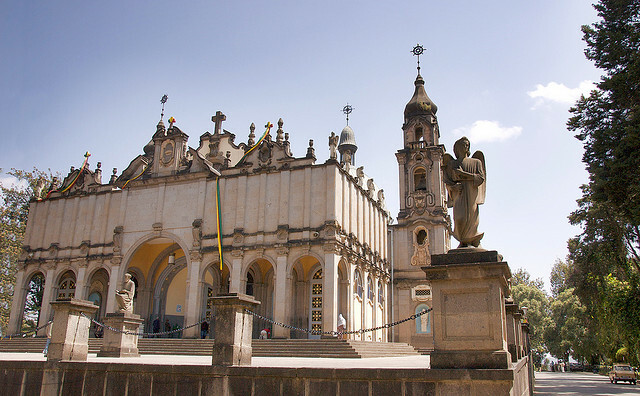 St George Church Museum is located in Arada Kifle Ketema, Addis Ababa, inside St. George's Church's compound. The Ethiopian National Postal Museum is located on the ground floor of the General Post Office building on Churchill Road. The Zoological Natural History Museum is located within the Arat Kilo campus of the Addis Ababa University. According to the UNESCO World Heritage list, Ethiopia has the biggest number of world heritage sites in Africa. With a total of nine natural and cultural heritage sites the country tops the list. Ethiopia and Morocco are first and second, respectively, among African countries on the UNESCO World Heritage list. Although they both have nine world heritage sites each, Ethiopia has been ranked higher because of two main reasons. The first is that Morocco has been grouped in the "Arab States" geographic zone as opposed to Ethiopia being in the "Africa" zone. The second, and more important, reason is that while all of Morocco's 9 sites are classified as cultural heritage sites, Ethiopia has 8 cultural and 1 natural heritage sites which allows for a higher ranking. Trivia: Ethiopia not only has the highest number of world heritage sites on the African continent, but one of the sites, the Rock-Hewn Churches of Lalibela, was one of the first sites that were chosen as a heritage site for the African continent at the list's conception. In 1978 the churches along with Senegal's Island of Goree were the first to be put on the list. Trivia: Among Ethiopia's sites on the list of World Heritage Sites, UNESCO has made attempts to increase the awareness of the importance of the African human origin sites in Ethiopia. The aim is to conserve and protect the areas from deteriorating. Located in Lalibela, a town in the Amhara Region, the site is home to 11 medieval cave churches that were built in the 13th century. Trivia: Built during the reign of King Lalibela it was intended to create a new Jerusalem after the capture of the original Jerusalem in 1187 - hence Lalibela also being known as "New Jerusalem". The plan appeared to the saint king in his dreams. The only natural heritage site in Ethiopia is also located in the Amhara Region of the country. The territory of the park encloses the Simien Mountains range that includes Ethiopia's highest - Mount Ras Dashen. The park is home to a multitude of endangered species. Among them are the Ethiopian Wolf (also known as the Red Jackal), the walia ibex, the gelada baboon - all which are endemic to Ethiopia - and the caracal. At the moment, this natural heritage site is the only one of the Ethiopian natural or cultural heritage sites that is also on the UNESCO List of World Heritage in Danger. Trivia: The Simien Mountains National Park was established in 1969 by Clive Nicol who wrote about his experiences in his book From the Roof of Africa. Fasil Ghebbi is a fortress and castle that is located in Gondar, a city in the Amhara Region of Ethiopia. 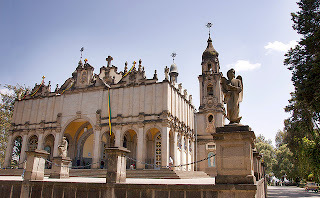 It was built by Emperor Fasiledes who ruled Ethiopia from 1632 to 1667. Covering an area of 70,000 Sq. m. Fasil Ghebbi also has many structures in its enclosure. It has palaces, churches and monasteries and even a market place. The first person to observe that "dotted among the palaces are what remains of the pavilions and kiosks of the imperial city" was Thomas Pakenham (Author of The Mountains of Rasselas: Ethiopian Adventure) who visited Fasil Ghebbi in the late 1950's. Trivia: The city has a mixture of building styles from Arab, Hindu to the Baroque style that was brought by Jesuit missionaries. Axum is a city that is located in the Tigray Region of Ethiopia. It is the site of royal tombs, ruins of castles and, most importantly, stelae and obelisks that date from the 1st to the 13th centuries that were built during the time of the ancient Axum Empire - one that was said to have given birth to the a state that was the most powerful one between the Eastern Roman Empire and Persia. Trivia: Axumites traded with ancient Greeks, Egyptians and Asians. They had fleets that sailed as far Ceylon (Sri Lanka). The Lower Valley of the Awash can be considered the exact location of where mankind was born. Located in the Afar Region of Ethiopia, it is the place where the approximately 3.2 million years old Lucy (Australopithecus) was discovered in 1974. A place that has yet to yield all of its secrets was to also be the place where Ardi (Ardipithecus ramidus), a fossil that was 4.4 million years old (1.2 million years older than Lucy), would be found in 1994. In 2000 Selam (Austrolopithecus afarensis) or "Lucy's baby" (despite the fact that she dies about 120,000 years before her) would be discovered. Trivia: Lucy, mankind's earliest fossil, was given the name because after discovering her Donald Johanson and his crew were celebrating in camp and were listening to "Lucy in the Sky with Diamonds" - a popular Beatles song. This cultural heritage site is located in the Southern Nations, Nationalities, and People's Region in the southern part of Ethiopia. It is the location of many fossil findings, the most famous of them being Homo gracilis. On the banks of the Omo River archeologists have found fossil fragments like the important finding of the now extinct Australopithecus man and Olduwan hominids of the early Pleistocene era. Trivia: The Omo region is the yardstick by against which all other ancient deposits in East Africa are measured by. Evidence was researched for the site to establish bio-stratigraphical, radiometric and magneto-stratigraphical scales spanning between one and 3.5 million years. Another cultural heritage site in the Southern Nations, Nationalities, and People's Region Tiya is also an archeological site. The site contains 36 monuments (including 32 carved stelae that, as of date, are covered with symbols that have not been decrypted). It is assumed that the stelae are of funerary significance because there are tombs scattered around the stelae. Trivia: The site is from an age of ancient Ethiopian culture that is yet to be precisely determined. Harar Jugol is a fortified historic town that is found in the Harari Region of Ethiopia that was founded by Arab immigrants from Yemen in the 7th century. The city is encircled by a wall. It encompasses 102 shrines and 82 mosques making it considered to be the fourth-holiest city of Islam. Some of the mosques date back to the 10th century. Trivia: When the Addis Ababa - Djibouti Railway was being built it was intended to run through Harar. But because of geographical and financial constraints the line had to be diverted away and the city of Dire Dawa was born in 1902. It is sometimes known as "New Harar". The Konso Cultural Landscape, found in the Southern Nations, Nationalities, and People's Region, is a cultural site that features 55 kilometers of stonewalled terraces and fortified settlements in the Konso highlands of Ethiopia. The fortified settlements constitute of a spectacular example of living in a cultural tradition that stretches back 21 generations (more than 400 years). The whole area demonstrates the shared values, social cohesion and engineering knowledge of the people. It also the ingenuity of mankind and how he can not only survive but also thrive in a hostile (dry and rocky) environment. Trivia: The terraces are used to not only retain the maximum amount of water needed but to also discharge the excess - all this while protecting the soil from erosion.